The first stop of the day is Philippi (approximately two hours). This was the city to where Saint Paul the Apostle delivered his first sermon and where he established the first church in Europe. "And from there (He went) to Philippi, which is the leading city of the district of Macedonia and a Roman Colony. We remained in this city some daysâ€¦â€� (Acts 16:12-18). Also, it is the site of where Saint Paul baptized a woman named Lydia, the first convert to Christianity in Europe. 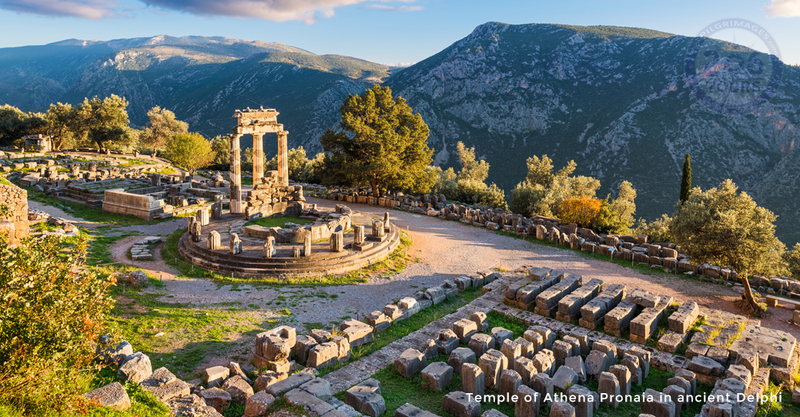 Additionally in Philippi, you will visit the Roman Forum where Saint Paul cast a spirit out of a fortune-telling woman. While here, you will have the opportunity to visit the prison (now in ruins) of where Saint Paul and Silas were thrown into by the owners of the fortune-tellers. Following this visit, you will continue into the modern port city of Kavala (approximately thirty minutes), which was once the ancient Neapolis. This port is where Saint Paul, Silas, Luke and Timothy landed when they sailed into Europe. After enjoying this city by the sea, you will transfer to Thessaloniki (approximately one hour and forty minutes) for a delicious meal and restful overnight. 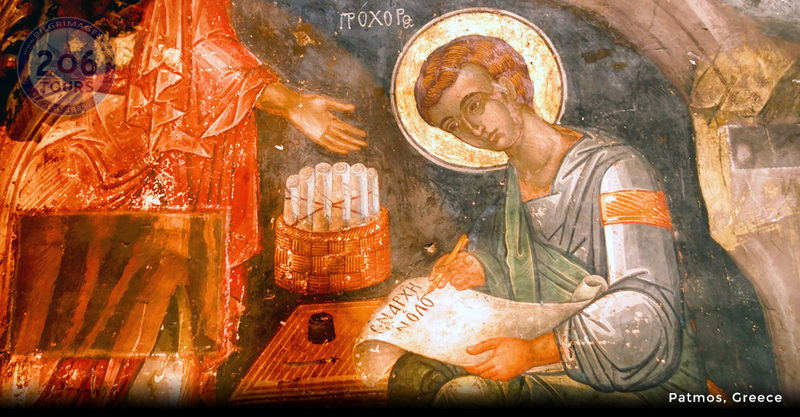 In the winter of 49-50 A.D., Saint Paul wrote two epistles to the Thessalonians. These letters urged Christians to â€œlive blamelesslyâ€� and to refrain from living idly while they wait for the second coming of Christ. While in Thessaloniki, you will witness a number of ancient artifacts such as the triumphal Arch of Galerius that is found at the start of Via Egnatia. Due to the convenient location, this arch was once a strategic artery of the Roman Empire. It was originally constructed in order to honor the Roman Emperor Galerius following the Roman victory over the Persians. Following your city-tour, you will transfer to Kalambaka (approximately two hours and forty minutes). 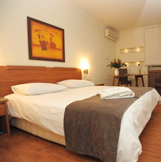 This evening, you will have a marvelous meal and a relaxing overnight in Kalambaka. Today, you will arrive at the lively Turkish port of Kusadasi. Upon arrival in Kusadasi, you will transfer to the small village of Mt. Koressos. 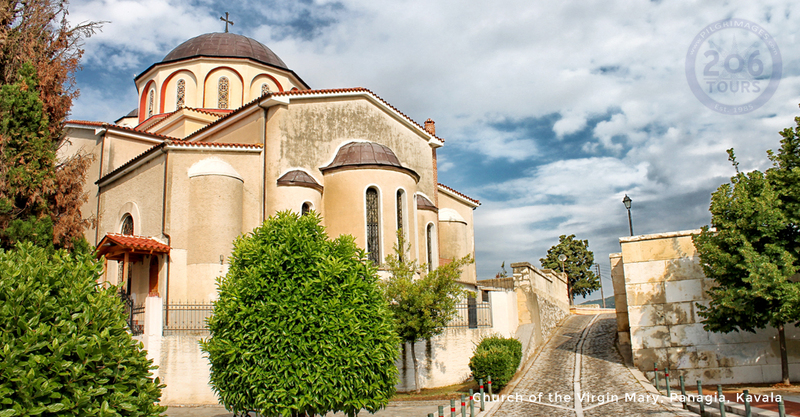 While in this village, you will visit the small stone chapel that is situated upon the site of where the Virgin Mary spent her last days following Christâ€™s crucifixion. 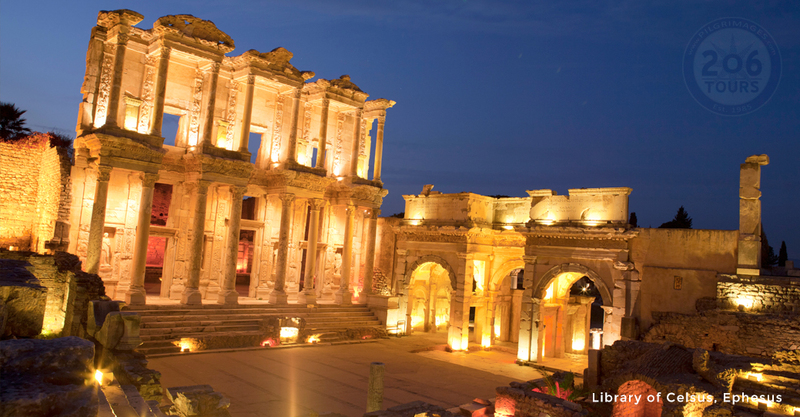 Following this visit, your group will walk through the Magnesian Gate to the ancient Ephesus. While in this ancient city, you will begin your walking tour that will take you through the most magnificent excavations in the world. 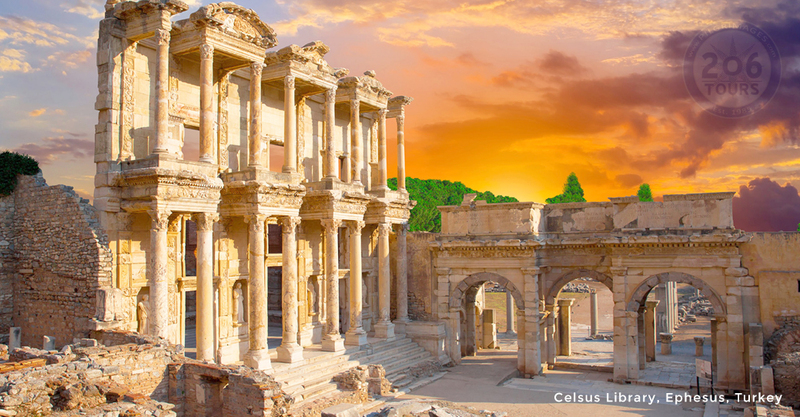 Some of the sites include the Odeon (concert hall), the Fountain of Trajan, the steam-heated Baths of Scolastika, the Temple of Hadrian and the Latrians, and the Library of Celsus. 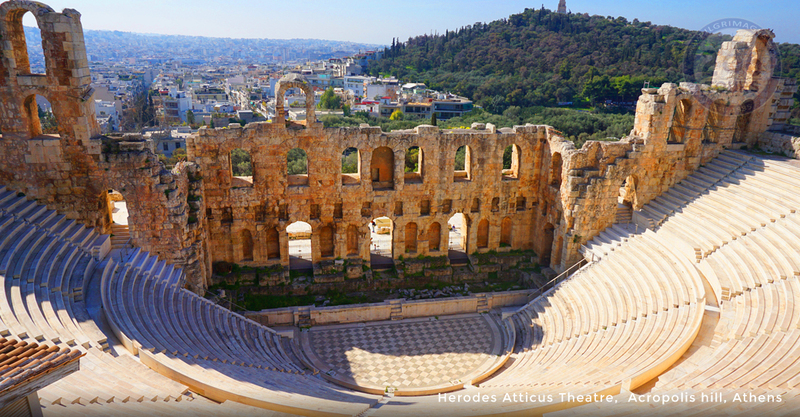 The last stop on the walking tour is to the Great Theatre, the largest ancient theatre that had a capacity of 24,000 people and is a site of where Saint Paul preached. On the return of your walking tour, you will follow the exact route that Mark Anthony and Cleopatra once rode in procession via the Arcadian Way. This main street runs from the Great Theatre to the main cityâ€™s harbor. 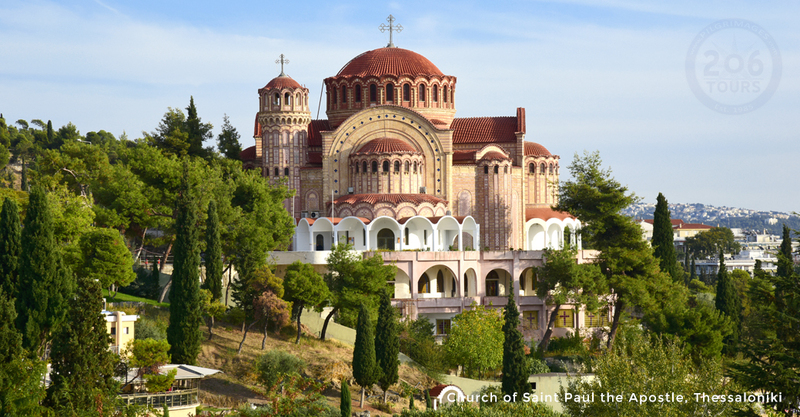 On your transfer back to Kusadasi, you will have the opportunity to view the Basilica of Saint John. In the sixth century, Emperor Justinian erected this structure over the grave of the evangelist, John. Upon arrival in Kusadasi, you will enjoy free time to explore this beach town before returning to the ship. 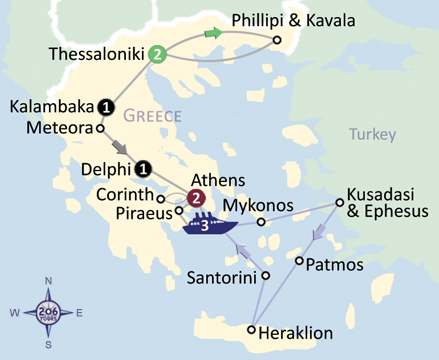 When you embark on the ship, your journey will continue to Patmos. 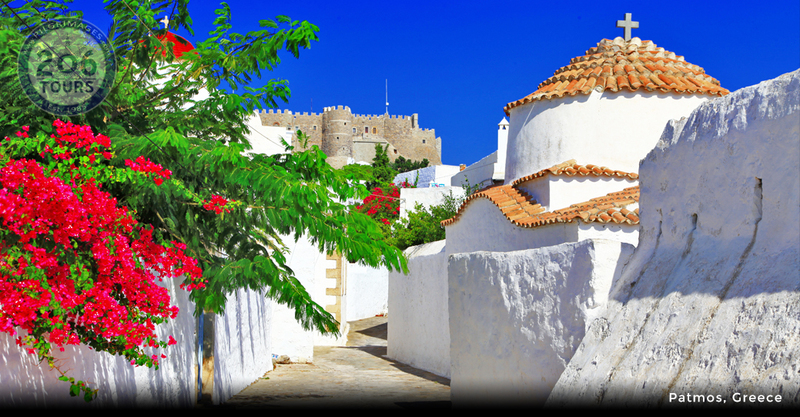 Upon arrival in Patmos, you will continue a short distance to the village of Chora. 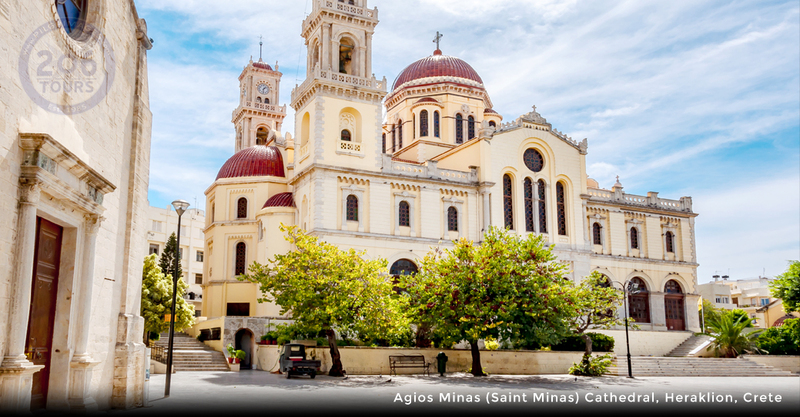 While in this islandâ€™s capital, you will visit the monastery of Saint John the Theologian. This marvelous structure was built nine-hundred years ago, and continues to be supported by the walls of a strong fortification. In addition to the stunning main church that contains outstanding frescoes, you will have the opportunity to view the beautiful courtyard, dining room, and the bakery. Your tour continues to the small museum where you will view priceless ecclesiastical treasures such as books, manuscripts, mosaics, icons, textiles, vestments, and jewelry. Following this visit, you will board the motor coach that will take your group to the Monastery and Grotto of the Apocalypse. 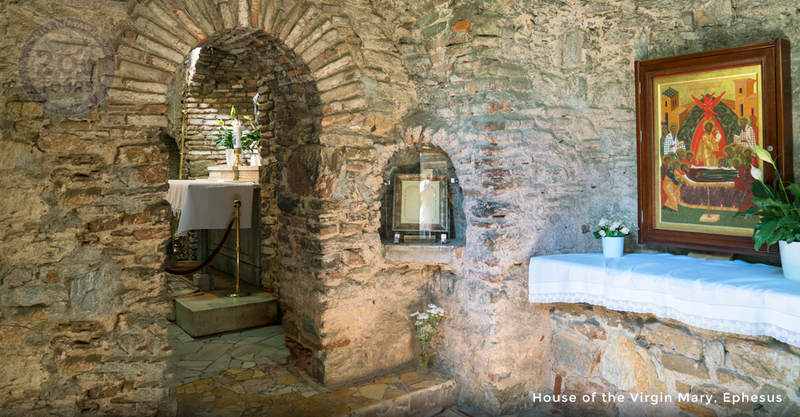 In this grotto, you will have the once in a lifetime opportunity to view the site of where the Book of Revelations was written. The silver niches in the wall mark the pillow and ledge that were used as a desk by the author of the Book. Additionally, you will view the three-fold crack made by the voice of God who emphasized the importance of honoring the Holy Trinity. Your day will culminate with a transfer to the port of Scala. While in this quaint and picturesque harbor, you will enjoy free time before returning to the ship. This morning you will awaken and transfer to the largest city on the island of Crete, Heraklion. While in this administrative capital, you will visit the ancient ruins of the Palace of Knossos. These ruins were discovered in 1899, and the palace is currently partially reconstructed. This ancient palace is believed to have been the mythical Labyrinth of King Minos and the seat of ancient Minoan culture. Additionally, it is the site of where Saint Paul met the owner and captain of the ship who warned him of continuing his journey to spread Christianity in Rome. 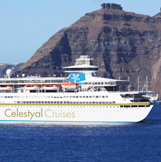 Following this historical visit, you will embark on the ship that will take you to the idyllic island of Santorini. 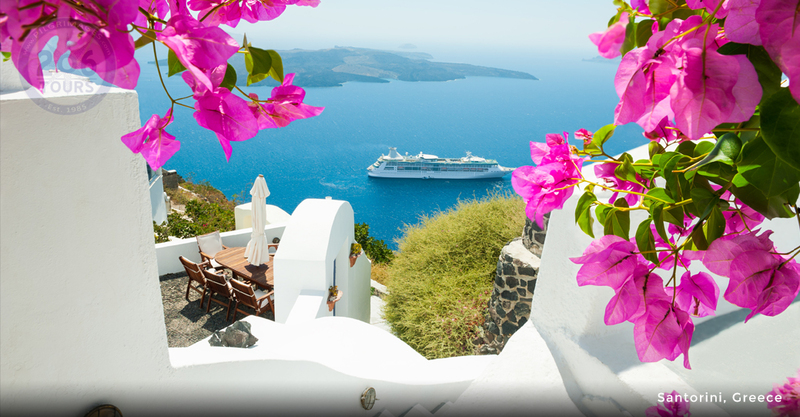 Santorini is definitively the most breathtaking island of all of the Greek Islands. 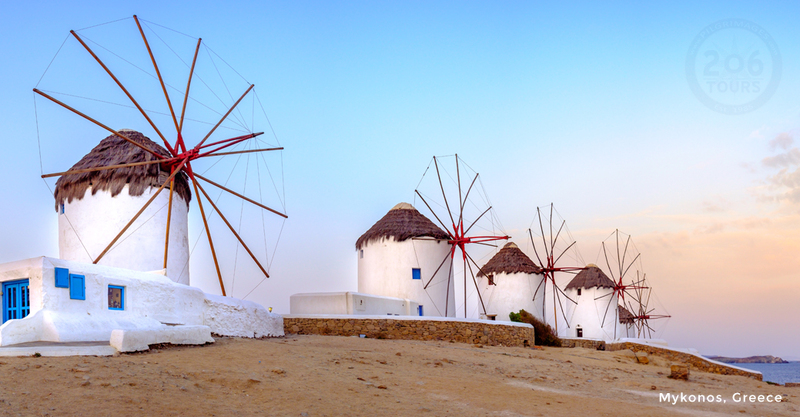 Upon arrival in Santorini, you will visit Thira where you will see the iconic white-washed houses, narrow streets, open-air cafes, and glittering boutiques that cling to steep cliffs. This evening you will return to the ship for your last dinner and overnight on your cruise. 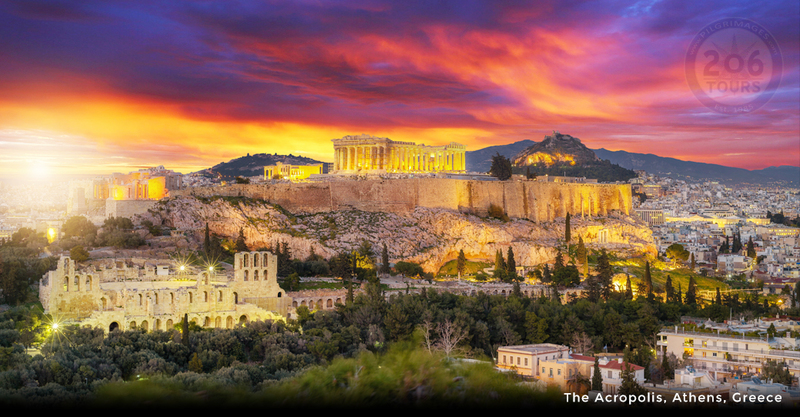 Morning Fly Athens to Istanbul Arrive Istanbul ; depart from the airport for an overview of the city of Istanbul which was the capital to two major Empires. Drive over Galata Bridge to the old town which was once known as Constantinople, continue to the Hippodrome, the center of activities during the Byzantine era and Ottoman Empire time for four hundred years. Here the chariots thundered the skies and grounds had been the scene to countless military and political dramas. See the Constantine Obelisk, the Serpentine Column which was a memorial, was brought from Greece and Egyptian Obelisk which was once located at the Karnak Temple in Luxor. Enter to the Blue Mosque (The Mosque of Sultan Ahmet I), world-renowned for the thousands of blue glazed tiles covering the walls. See the grandeur of a 17th Century old masterpiece. Later walk to St. Sophia which was a mighty church at the center of Byzantine Constantinople. The building dates back to 535 AD and was built by Emperor Justinian. It was converted to a Mosque in 1452. Today it is a museum . 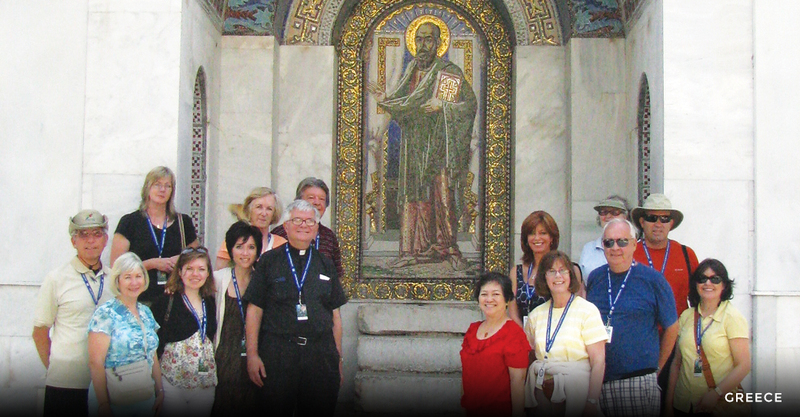 See the largest cupola and fine Byzantine mosaics of the Church. Visit The Basilica of St Anthony of Padua ,the most prestigious Catholic Church in Istanbul. An imposing red brick building, it was originally built on this site in 1725, but was demolished in the early 20th century, in order to make way for a tramway. However the church was rebuilt by the architect, Giuliu Mongeri and completed in 1912, and stands as a fine example of the Italian neo-Gothic and Tuscan-Lombard styles. Dinner and overnight at your Hotel. Morning drive thru Golden Horn and visit Church of Chora. The first Church of the Holy Saviour in Chora (as it was originally known) was built during the reign of Justinian (527-565) on the site of a former chapel that was located just outside the first city walls (but within the Theodosian Walls that still exist today) that surrounded the capital of the Byzantine Empire, Constantinople. 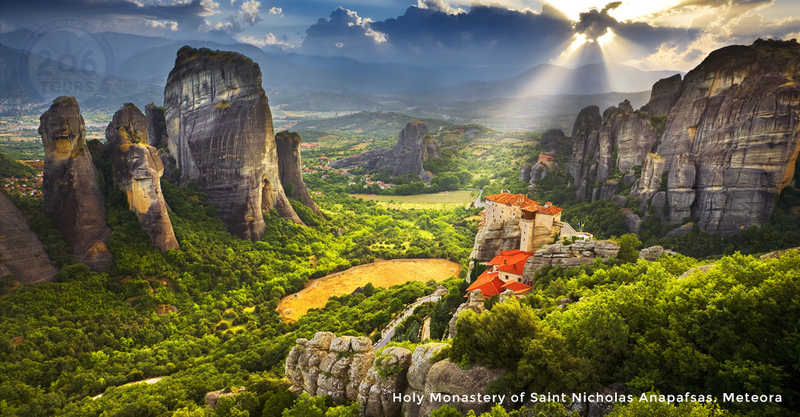 The word Chora is the ancient Greek word for countryside â€“ a reference to the fact that the original chapel was outside the city walls, in what would have been fields. The mosaics of the former Chora Church tell biblical stories, which can be followed like a graphic novel. On the North wall of the inner narthex there are 17 images depicting the life of the Virgin Mary, including her birth, first steps, and marriage. Next, visit Balat old Jewish neighborhood. Its name from the Greek word â€œpalationâ€�, meaning palace. Balat has unique architecture, churches, synagogues, trade guilds and social life. 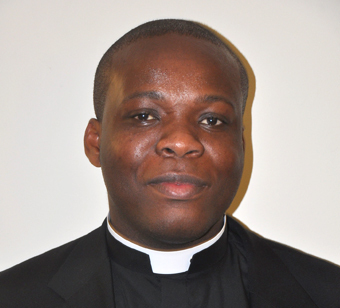 Visit Cathedral of Holy Spirit ;the Cathedral, built in Roman style in 1845-46, has been the See for ten years, from 1934 to 1944, of the Apostolic Delegate Angelo Giuseppe Roncalli, who later became Pope with the name of John XXIII. and in 2016 has been canonized. His portrait, on the left of the cathedral was painted in 2000, when his name was given to the street behind our cathedral. This cathedral is the main spiritual center for the Latin Catholics of the Vicariate of Istanbul, who is the Pastor (Apostolic Vicar â€“ Bishop) of the Latin Community.The Holy Spirit Cathedral gave a warm welcome to four popes, whose names are written on the commemorative plaques on the church walls. Afternoon Bosporus Cruise; An amazing cruise between the two continents, EUROPE and ASIA, along the Bosporus by the DolmabahÃ§e and Beylerbeyi Palaces, wooden villas and mansions . Dinner and overnight at your Hotel. 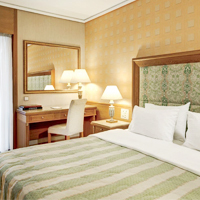 Following breakfast at your Hotel transfer to the Airport for your return flights Home. 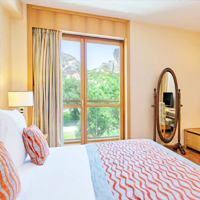 Morning Fly Athens to Istanbul Arrive Istanbul ; depart from the airport for an overview of the city of Istanbul which was the capital to two major Empires. Drive over Galata Bridge to the old town which was once known as Constantinople, continue to the Hippodrome, the center of activities during the Byzantine era and Ottoman Empire time for four hundred years. Here the chariots thundered the skies and grounds had been the scene to countless military and political dramas. See the Constantine Obelisk, the Serpentine Column which was a memorial, was brought from Greece and Egyptian Obelisk which was once located at the Karnak Temple in Luxor. Enter to the Blue Mosque (The Mosque of Sultan Ahmet I), world-renowned for the thousands of blue glazed tiles covering the walls. See the grandeur of a 17th Century old masterpiece. Later walk to St. Sophia which was a mighty church at the center of Byzantine Constantinople. 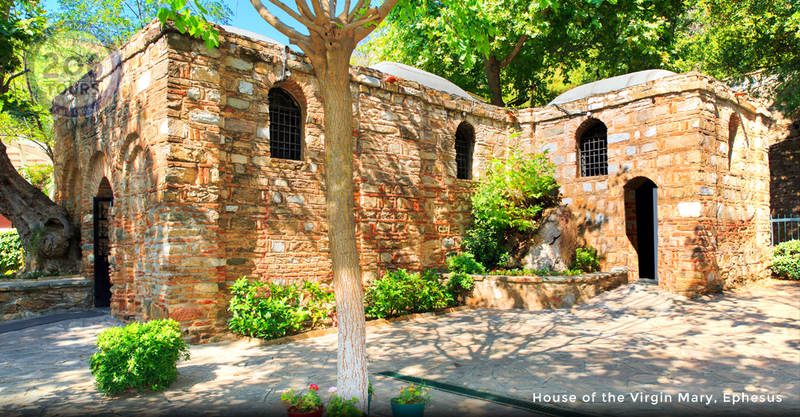 The building dates back to 535 AD and was built by Emperor Justinian. It was converted to a Mosque in 1452. Today it is a museum. See the largest cupola and fine Byzantine mosaics of the Church. Visit The Basilica of St Anthony of Padua ,the most prestigious Catholic Church in Istanbul. An imposing red brick building, it was originally built on this site in 1725, but was demolished in the early 20th century, in order to make way for a tramway. However the church was rebuilt by the architect, Giuliu Mongeri and completed in 1912, and stands as a fine example of the Italian neo-Gothic and Tuscan-Lombard styles. Dinner and overnight at your Hotel.